For as long as I can remember, every conversation between my mom and grandma has included some variation of the question, “¿Y qué serviste?” (And what did you serve?). They, along with my aunts, have been swapping recipes for decades. And these days, when I video-chat with my grandma across continents, we exchange menus and recipes as well. 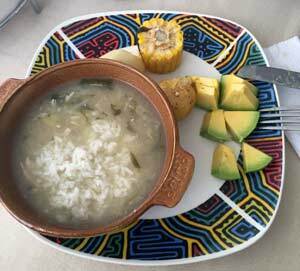 Although the Jewish community in Barranquilla, Colombia (proud hometown of Sofia Vergara, Shakira and Miss Universe 2014, Paulina Vega), where my mom grew up and my grandparents still live, is small, it is uniquely close knit and rich in culture—and culinary offerings, too. The first Jews arrived in Colombia from Curacao in 1824. The community today, and the one in which my mom grew up, is made up primarily of Ashkenazic Jews leaving Eastern Europe after World War I and Sephardic Jews who arrived in the 1960s from Syria, Egypt and Turkey. With such a mix, the category of “Colombian Jewish food” is elusive. My own great-grandparents came from Poland and Romania in the 1920s, with my young grandfather in tow. Colombia was not quite the final destination for either side, but it’s turned out to be, well, delicious. Despite being one of the few of her generation who was born in Colombia, my grandma learned “Old Country” cuisine and traditions, and our family’s Rosh Hashanah and Passover meals feature matzah balls and gefilte fish with homemade chrain (the horseradish root imported from Miami). When I was young, we would often bring insulated bags of bagels, cream cheese and lox, which weren’t available there. Sephardic dishes, like borrecas (also known as bourekas) and kibbeh, have become part of our family’s repertoire, too, as have Colombian classics, such as arroz con pollo (rice with chicken) and ajiaco (a hearty chicken and potato stew frequently eaten in colder parts of the country, including Bogotá, the capital). On Passover, we eat arepas, a thick tortilla-like corn cake that comes in several permutations—sweet, salty, cheese-filled, deep-fried and filled with an egg—and on Christmas Day, like non-Jewish Colombians, pasteles, a cornmeal dough stuffed with chicken (not pork), then wrapped in banana leaves and steamed. My favorites, however, are the hybrids: babka with guava paste ribbons and cholent (chulnt as we call it)—which may seem like overkill in the equatorial climate—with a touch of sweetness from panela (a block of dried unrefined cane sugar), served with a cool glass of tropical fruit juice. As Colombia becomes a hot travel destination—Beaches! Food! Music! Direct flights from New York and DC!—more and more people I know are encountering its tropical fruit and the ultimate beachside lunch of freshly caught fish, deep fried (top photo), and coconut rice. My Colombia, though, is one where plantains share the spotlight with potato kugel, meat is just as likely to find its way into stuffed cabbage as sancocho (a Colombian stew) and mandelbroit (mandelbread) are studded not with walnuts, but with glistening gems of guava paste. Top photo: Fried fish and plantains in Colombia. Merav Levkowitz is JFE®'s editor-in-chief and a writer, editor and content strategist. The daughter of an Israeli and a Colombian, Merav speaks six languages and has eaten her way around the globe. At any moment, Merav is planning either her next meal or her next trip—or both.